Struggling to find work-life balance Feeling overwhelmed or frustrated Learn how to increase your happiness in just 10 minutes a day Feeling busy, stressed or disappointed has become the new normal. The truth is it doesnt have to be that way and the solutions are simple. Instead of hoping for happiness, what if happiness is something you DO, something you CHOOSE every day The good news it is. Psychologist and happiness expert Ingrid Kelada provides a step-by-step guide to help you increase your personal happiness and feel more motivated. You can learn how with simple 10-minute strategies. 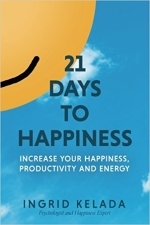 Each day of the 21-day journey focuses on one key area of your life, including Time how to break the cycle of chaos and manage your time effectively. Body Language exploring the surprising links between body language and happiness. Relationships how to make the most of the number one predictor of happiness. Work how to use your strengths and talents so that you are engaged and motivated. Happiness is a choice. A daily decision to choose happy can be easy, fun and rewarding. 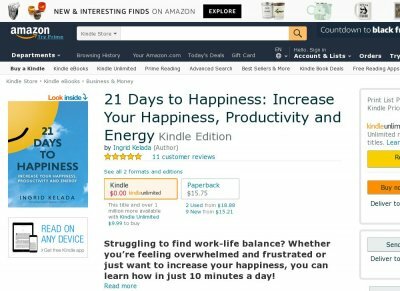 With this book, in just a few minutes per day, you can practice one new happiness habit and jot down your notes in the journal section. At the end of three weeks, along with increased happiness, youll find youve become more productive focused patient energetic healthy motivated positive Buy 21 Days to Happiness today to create a happier more satisfying life.